I was getting too many similar comments for it to be discounted as rumour. Sherford will soon be getting its first bus service following a review of the city’s subsidised network. Launching in September, the 2A will be operated by Stagecoach South West and link the new community in the east with Saltash in the west, via Plymstock Broadway, Pomphlett Roundabout, the city centre, railway station and Milehouse. It will run every 20 minutes during the day from Monday to Saturday and hourly in the evenings, on Sundays and on Bank Holidays. Stagecoach South West will also take over nine of our 11 financially supported services (7D, 13, 14, 18, 19, 31, 39, 52 and 223) from Monday 29 October, with customers seeing a number of improvements. Service 14 will be extended to Derriford (restoring an hourly service to residents of Powisland Drive, Dunraven Drive and Upland Drive from Monday to Saturday). Service 52 which links Plympton, Leigham and Asda in Estover to Derriford Hospital, will be extended to serve Crownhill, Hartley Vale, Compton, Mannamead and the city centre, replacing the current service 39 and providing new cross-city links as a result. We are also stepping in to fund replacement services for Holly Park and Ringmore Way (where the commercially-run services 50A and 51A are being withdrawn) and Mainstone (currently served by the 28A). The replacement services will continue to be operated by Plymouth Citybus. Well that confirmed the news that Stagecoach are indeed taking on the tenders from Target Travel. S17 - Licence revoked with effect from 23:59 on 27 October 2018. Acceptance of Tristan Kelly as nominated transport manager until revocation. There have been comments suggesting that a new licence has been applied for which will presumably be for a smaller coach only operation if it goes ahead. 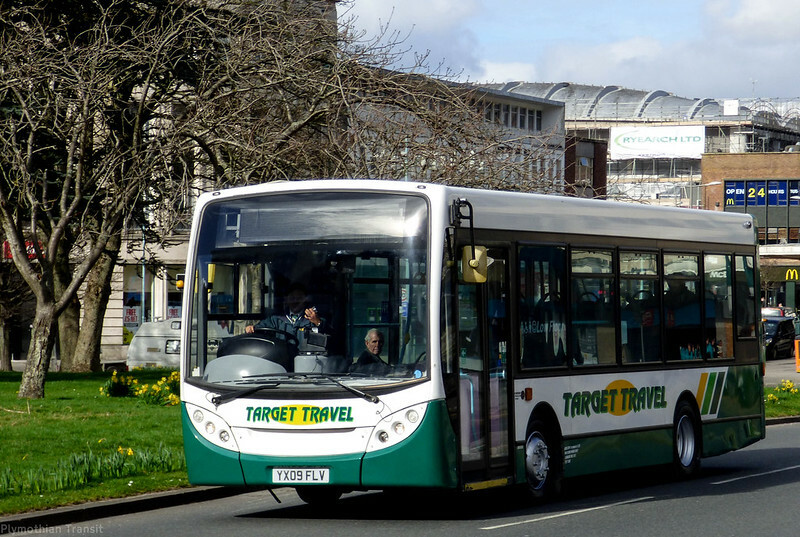 Target Travel have been a part of the Plymouth bus scene for many years now being there to pick up the services which the bigger operators didn't want. The fleet has been upgraded and looks a lot better than it used to, and services have seemed reliable. It seems that drivers have been offered the chance to transfer across to Stagecoach so hopefully none of them will loose their jobs which is a good thing although I know some of them like driving to Target precisely because they are not First, Stagecoach or GoAhead. So now seems a good time to catch up on any Target Travel photos as I cant see many of the buses going to Stagecoach, or if they do, not lasting very long with SC. Any news about Target's work around Tavistock? All the Tavistock bus services have now been put up for tender. I take it that will mean the end of the PR3...leaving that to SC 101? What will happen to DCC 59? 89 on Tavi and all the moors services 55 etc are these likely to go to SC too? Will Target see out their contract do we think. If they are going to have licence revoked and many drivers are likely to leave early as won't want to xfer to SC? They won't be able to attract new drivers surely. If they have licence revoked will they be able to continue to operate their other services? The council says the 14 will be extended to Derriford but doesn't it currently terminate there? Assume the 2A will simply be extended beyond Elburton breaking its current loop operation? I can't see Stagecoach taking *any* buses from Target. It would be highly unusual if they did. Anyone know why Target have had their licence revoked? Unless they do what some operators do find a dead relation to hold the op licence. All Targets Devon County contracts are up for re tender now. Any idea when Devon County tender results will be known? Do we think Target will manage to see out their contract routes until end of October or potentially Stagecoach take over early on hire to Target perhaps? I saw drivers in a stagecoach uniform on the target routes 87 and 89 when I was in Tavistock on Saturday. I would imagine Stagecoach will at least pick up the 87 and 89 perhaps 55 and 56 too. They may well have to compete with GO Ahead for the Plymouth area ones such as 49,59 and 94 unless they go for job lot like Plymouth City tenders? I see Target are starting a new football special PA2A this week. Are they still Ok to operate these with licence being revoked? Any know if PR3 will continue or not? Does anyone know if Target have applied or been successful in obtaining a new licence and if so is it just for coaches now? How many did they have? Target have got a new licence apparently but only a smaller operation. Will operate PR3, School services and pafc only from October 29. Whom will run their school services then...such as Devonport High boys and girl's contracts plus some to Ivybridge from South Hams? If Stagecoach have take over most of Targets services id imagined they will try to merge them into their current routes or try to join them up if possible, reduces vehicles and drivers required. PCB take over PR3 from Target at start of October. Interesting to see how Stagecoach react as this is direct competition with their 101 on same route from Hospital to George?